This is the second part in a series of guidance on education. It deals with maintained schools and sets out the types of issues with which we may be involved. Our general approach in dealing with casework involving maintained schools is to engage only where relevant permissions or authorities may be required for charitable trusts attached to maintained schools. We will not provide Orders or Schemes simply for avoidance of doubt or to provide comfort for those carrying out particular tasks. We may also be required to liaise with the principal regulator in cases where we are required to act - see OG717-1 Exempt Charities and Principal Regulators. The Department for Education (DfE) is the principal regulator for governing bodies of voluntary (aided or controlled) or foundation special schools. Any foundation body established under s21 of the School Standards and Framework Act 1998 in England is regulated by DfE and in Wales regulated by the Welsh Government. This guidance sets out how the law currently affects maintained educational provision in England and Wales which is funded through Local Authorities. It considers the different classifications for schools and the impact this has on the way we approach school cases. Section B sets out how the School Standards Framework Act 1998 classifies the different types of maintained school and a definition of a maintained school can be found at section B4. Section B4.1 provides a table setting out the different governance and control provisions by school type. The different issues with which we may be involved are set out at section B4.3. There is a Casework Checklist at section C1 which sets out how we identify relevant casework issues in connection with maintained schools. The Legal Framework at section E1 sets out the relevant Education Acts. F1 What do I do if I receive a case that is about a non fee-paying school? F2 Is the Charity Commission responsible for all aspects of work to do with maintained schools? F3 What is a maintained school? F4 What are the issues we will be expected to deal with? 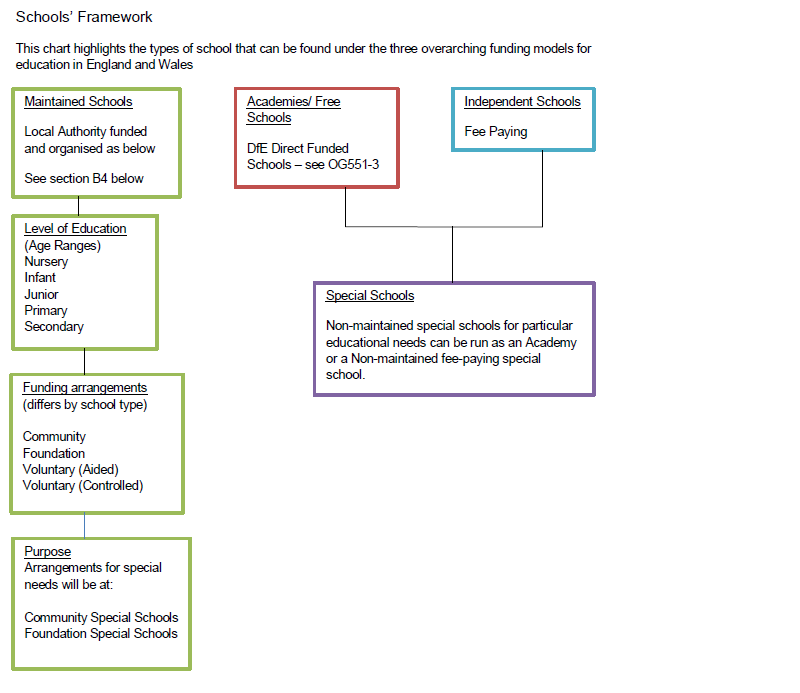 The SSFA 1998 put in place a basic structure for maintained schools in England and Wales. In addition to the new framework for maintained schools it also changed the existing categories. The first changeover to these new categories took place on 1 September 1999. Maintained schools are those which are funded by the Local Authority - a full definition is set out below at B4.1. The SSFA did not entirely replace earlier Education Acts and parts of those are still in force. In turn the SSFA has itself been amended by the Education Act 2011. Acts relevant to Education are listed in section 578 of the Education Act 1996.
by purpose, judged by whether or not they meet special educational needs (see B3.3 below). Each classification is broken down in to subdivisions, which may be subdivided again. a primary school - usually children up to 11.
maintained schools receive funding from local authorities and do not charge fees. Government policy is that children with special educational needs (a learning difficulty requiring special educational provision) should usually be educated at mainstream schools. But that is not always possible and appropriate. Therefore some schools ('special schools') are organised to make special educational provision for pupils with special educational needs. (for the time being approved by the DfE), non-maintained special schools (ie Academies or independent fee-paying special schools). The framework for maintained schools is set out in the SSFA1998 under section 20. Some special schools are LA maintained schools, and can be community or foundation special schools. Pupils at a special school will usually have been assessed and given a statement of special educational needs. Some special schools are independent schools outside of the maintained system. Additionally, Local Authorities are now required to make provision for nursery education. Early education for 3 and 4 year olds may be offered in nursery schools, nursery classes, or in reception classes in primary schools. All of these are examples of LA maintained schools, but some 3 and 4 year olds may be offered places in private day nurseries or independent nursery schools. It is important to remember that the term "maintained School" has not always had the same meaning as now. This difference can be seen in the definition from the Education Reform Act 1988 compared with the School Standards Framework Act 1998. Where the term comes up in casework, for instance in a Scheme, we take the view that this includes any type of school within the definition applying at the time we are considering it; not the situation as it was when the Scheme was made. This approach is endorsed by education legislation; it does not change the trust provisions but simply gives us an up-to-date view of where they may be applied. The chart below gives an overview of the status, structure, governance and control in the various types of maintained schools and highlights the types of issues we may get involved in with maintained schools. This table is further explained at section B4.3. Not generally applicable as the school is not charitable and is under LA control. * (Funding) Church of England Voluntary Aided School - Land and buildings vested in the Diocesan Board of Education with the Vicar and Church Wardens as managing trustees. The governing body of the school is responsible under the SSFA 1998 for capital costs, in turn they may ask the underlying charity for help with this. In turn, the underlying charity can ask the Diocesan Board of Finance for help. The governing body is able to access up to 90% grant funding from the Department for Education. the part which is primarily governed by the law of education, including the Instrument of Government (see Responsibilities of Governing Bodies below). This could broadly be described as the "people" side of the school, and consists of the governing body, staff and pupils. Its job is to carry out the day-to-day running of the school's activities. This is referred to in this part of the guidance as "the school". the part which is primarily governed by charity law and therefore comes under the jurisdiction of the Charity Commission. This is the charitable foundation and is managed by the charity trustees. It could broadly be described as the "property" side of the school. It consists of some or all of the school buildings and property, and sometimes of investments as well. It is subject to the governing document of the charity, and the occupation and use of the premises is subject to various statutory provisions. This is referred to in this part of the guidance as the "property trust". DfE as the principal regulator for maintained schools can invite us to investigate any concerns but this would be in rare or extreme circumstances. We have jurisdiction to give advice or decline legal authorities subject to consulting with the principal regulator. Every maintained school is required by section 20 of the Education Act 2002 to have an instrument of government which determines the constitution of a governing body and other matters relating to the school. The Charity Commission has no jurisdiction over instruments of government. The school is run by a governing body. This is a body corporate (a statutory corporation not a company) and consists of a number of governors. Confusion can arise sometimes because trustees of the related property trust are often also referred to as governors. These are two very different roles and the Commission has direct jurisdiction only over the trustees of the related property trust - it is therefore important to be clear when using the term "governor" to which role we refer. In this guidance we use "governor" to mean a member of the governing body, part of the school and subject to education law. More information about the typical make-up of the governing bodies of the various categories of maintained schools will be contained in the detailed guidance on those categories. The School Governance (Constitution) (England) Regulations 2012 (as amended)) and Government of Maintained Schools (Wales) Regulations 2005 (as amended) set out arrangements for the way governing bodies are constituted. In voluntary schools the Instrument of Government will require a specified number of governors to be “foundation governors”. These governors have the additional duty of ensuring compliance with the trusts attached to the property. For a church Voluntary school it is usually the Diocese that makes the appointments of foundation governors. It is rare that the property charity itself can make the appointment although we would have no objection to this. As stated above, there is a distinction between governors (those who run the school) and trustees who have responsibility for charitable property. In some cases the governing body of the school may be appointed as the trustee of the property trust. It is important that we distinguish between their responsibilities as governors under the instrument of government and their responsibilities as trustee of the property trust. It is very important that we clearly identify who the trustees of the property trust are – it might be the governing body as a corporate body or it might be the persons who are from time to time governors. c. any co-opted governor nominated by a minor authority." Whilst it might be argued that there can be benefits from the same people holding both roles, (eg the school and property trust will be led by people with the same vision, reducing the potential for conflicts which may have a negative impact on the provision of education) caseworkers and trustees need also to be aware of the potential for governance problems where this occurs. difficulties with granting a lease of the property if the trustees and governors are identical. conflicts of interest between the school and the property trust that are not easily resolved if all the people involved are conflicted. If we are involved in making a Scheme or Order or offering advice regarding a modification order (made by DfE) we will not, as a matter of policy, provide for or recommend or agree to a change that results in the governing body of the school being the trustee or trustees of the property trust. The schools met full national curriculum requirements, but had a special focus on their chosen specialisms. Such schools worked in partnership with private sponsors and were, in some cases, supported by additional government funding. Government policy is now not to limit schools to any particular specialism so no more of these schools will be created. However, there may be some specialist schools still in existence. An extended school is one that provides a range of services, often outside the normal school day, to help meet the needs of its pupils, their families and the wider community. The school governing body will consider what types and levels of activities and services it can provide, in or through the school, and has to discuss plans with the Local Authority, and any other relevant groups or individuals (including the trustees of the property trust). Once such plans have been agreed, there is no restriction on who can set up or manage the activities or services. While smaller programmes can be led by a separate group or committee within the school (involving governors, head teacher, local authority staff or parents), for larger programmes, the school may delegate the management to existing agencies or partnerships like an Early Years Development and Childcare Partnership. At present, government policy does not favour having non-educational activities taking place within the school context other than on separate commercial terms. Whilst in casework terms these cases are low volume, they may create issues for us to consider if non-charitable activity is taking place on charity property. Conversely, it may be the case that a group which is set up under the Extended Schools Initiative is itself capable of charitable status, provided it has sufficient autonomy from the school. Note, where the property is held on trust for education or for advancement of a particular religious belief, the full range of extended services being proposed may be outside those trusts. For our purposes we need to be sure that where a maintained school holds charitable assets any transfer of those assets is to a charity with similar objects. Whilst all charitable schools/ school property will fall under “the advancement of education” the founder’s intention may have been to assist either a type of school (eg voluntary or faith based) or an age range (eg under 12s). When considering cy-près situations on school closure or requests for merger these factors will form part of the considerative process. However, we are not otherwise constrained to keep educational charities grouped by age or type of school where no restriction exists in the trusts (even where use has been as such by necessity). If we are involved in dealing with the proceeds of sale of school property previously used by one age range we usually provide for the money to follow the pupils or existing beneficiary class – eg if a new school is being provided for that age range in the locality we would provide for its application there. If that is not possible or practical we can agree to its application at any other school in the area. In this guidance foundation schools is used to mean trust schools or foundations created under the SSFA (ie not Voluntary Controlled or Voluntary Aided). The School Standards and Framework Act 1998 states that the governing body of foundation and foundation special schools are exempt charities, although there may again be other charitable funds held in association with the school. These funds may or may not be exempt - see OG717-2 section B2 and case studies at section D.
The School Standards and Framework Act 1998 created a new type of foundation school also known as a trust school partially to replace grant-maintained schools. It is important to note all schools which operate on sites held on trust for a school are foundation schools. There is a difference between foundation schools with a foundation (ie where the foundation appoints governors) and foundation schools without a foundation (where the foundation does not appoint governors). A grant-maintained school was a school that had opted out of local authority control but still received central government funding, and was an exempt charity under Schedule 2 of the 1993 Act (similar to an academy today). Most grant-maintained schools either became foundation schools or reverted to Voluntary Aided status in 1999. In foundation/trust schools established under the SSFA and Voluntary Aided schools, the governing body employs the school's staff and have primary responsibility for admission arrangements. The school's land and buildings are owned by the governing body (trust schools) or a charitable foundation (Voluntary Controlled, Voluntary Aided schools). If a foundation school was originally provided by a charitable foundation, the trustees of that foundation hold the school premises on trusts which usually require or sometimes authorise them to permit the statutory school governing body to use and occupy the premises for the purpose of conducting the school in those premises. The trustees may hold other trust property for the support of the school, and possibly also for other educational purposes. The precise trusts attaching to the property of the foundation are specified in the charity's governing document. The governing body of the school will include foundation governors who may or may not be appointed by the property trust. The charitable foundations which originally provided the schools and the school governing bodies are now clearly regarded as distinct entities. Therefore, while the governing body has responsibility for the running of the school, the body of trustees has responsibility for the management of the property trust charity. The statutory school governing bodies have specific characteristics. The governing bodies are corporations, with their own distinct legal framework of objects and powers, rules about capacity, dissolution provisions etc. The status of these bodies as exempt charities is explicitly declared by statute - now section 23(1) of the SSFA 1998 and schedule 3 to Charities Act 2011. Section 21 of the SSFA 1998 gives power to create a group called a "foundation body". Such a body is an exempt charity. Such a body would exercise, for a group of at least 3 voluntary or foundation schools, the functions of property owning and appointing of foundation governors, which are traditionally associated with a voluntary foundation providing a school which is now maintained. Regulation 3(2) of the Education (Foundation Body)(England) Regulations 2000 (as amended) and Regulation 3(2) of the Education (Foundation Body)(Wales) Regulations 2001 (as amended) provides that a school which has a foundation, other than a foundation body, may not form part of a group and its governing body may not propose the establishment of a foundation body. So an existing VA or VC school could not join or be run by a foundation body. The property trust is subject to the usual requirements of registration unless it holds only the site of the school (excepted), or is caught by section 28(3) of Schedule 3 of the Charities Act 2011. Any foundation created by s.21 of the School Standards and Framework Act 1998 (a foundation body - see B5.4 above) will be an exempt charity. NB The governing body ("the people part") of any foundation school or foundation special school is an exempt charity. Some foundation schools are established to provide for children with special educational needs. This is the only difference between them and their “mainstream” counterparts. Community schools were formerly known as county schools. Their name was changed by the School Standards and Framework Act 1998. Some are now also known as Grammar school and may exercise some element of selection in the admissions process. Community schools themselves are not charitable and thus we have no jurisdiction over them. However, charitable trusts administered by the statutory governing bodies of such schools are registerable with us in the usual way. The Commission's involvement with community schools is likely to be rare because they have often been set up by local education authorities or their statutory predecessors out of their corporate property and are therefore not charitable. However, the site of such schools may be subject to a charitable trust. The scenarios we may come across in such schools are discussed in B6.4 below. We are occasionally asked to become involved when a community school closes and disposal of its premises are contemplated. The governing body, parents or the LA may have doubts about whether the premises belong to the LA as part of its corporate property. Our first response should be for the relevant party to get their own legal advice. We cannot determine the existence of a trust - only form a view. We should not volunteer to give advice. In the great majority of cases the LA will have purchased the site for the community schools using money raised in its statutory capacity. If so, the site as well as the school will be outside the jurisdiction of the Commission, and we will have no interest in it. Schools (usually grammar schools) in respect of which the Board of Education made schemes providing for the premises to be held by a County Council (LA) as trustee, and provided for the premises to be used by the LA for the purposes of a secondary school. It should be apparent from the conveyance, transfer or agreement document, which one of these 3 categories, it falls into. However, if there is any doubt about this or about whether or not we have any jurisdiction over an organisation associated with a community school, the LA, governing body or parents groups will need to take legal advice. If we need to be involved we will consider the advice obtained as part of our overall consideration. Caseworkers may need to get technical or legal advice. Some community schools are established to provide for children with special educational needs. These are called community special schools. In all other respects they are the same as their “mainstream” counterparts. The structure of existing voluntary schools was left largely unchanged by the SSFA 1998. They continue to be either aided or controlled. Additionally, grant-maintained schools which were formerly voluntary aided will have become voluntary aided schools again. A voluntary aided school is a maintained school which is mainly funded by the local education authority, often with a religious organisation, usually a church, providing the capital funding for land and buildings and therefore having a say in the religious education policy of the school. A voluntary controlled school is a maintained school which is funded entirely by the local authority. Normally a voluntary school will have a 'designation order' from DfE and it is DfE who is also the principal regulator for the school. Voluntary schools' governing bodies will include governors called "foundation governors". The arrangements for appointing "foundation governors" will be found in the school's instrument of government and frequently will not involve the charity trustees although our preference is for the charity to be involved. In section 142(1) of the SSFA 1998, the term "foundation governor" for the purpose of the Act defines a foundation governor as someone who is appointed as a foundation governor in accordance with regulations under section 19 of the Education Act 2002. The statutory school governing bodies have their own institutional characteristics. The governing bodies are statutory corporations, with their own distinct legal framework of objects and powers, rules about capacity, dissolution provisions etc. Section 21 of the SSFA 1998 envisages the possibility of creating a group called a "foundation body". Such a body must consist of a group of at least 3 voluntary or foundation schools and exercise the functions of property owning and appointing of foundation governors, which are traditionally associated with a voluntary foundation providing a school which is now maintained. If a school leaves the foundation body and the number of schools drops below 3, then the foundation body must dissolve. Regulation 3(2) of the Education (Foundation Body)(England) Regulations 2000 (as amended) and Regulation 3(2) of the Education (Foundation Body)(Wales) Regulations 2001 (as amended) respectively provides that a school which has a foundation, other than a foundation body, may not form part of a group and its governing body may not propose the establishment of a foundation body. Therefore it follows that where a school was originally established by a charity, it must have a foundation, that is to say a body of persons (whether incorporated or not but excluding the governing body) holding land on trust for the purposes of the school and consequently such a school cannot be one of a group of schools for which a foundation body has been constituted under the provisions of the SSFA 1998. When using the term "governors", it is important to be clear whether this is being used to refer to the members of the school's governing body (who are always called governors and who are not subject to our ordinary jurisdiction) or to the charity trustees of the associated property trust (who are sometimes also called governors and who are subject to our jurisdiction). Trustees called governors are responsible for meeting the requirements of charity law under the governing document. The governing body constituted under the instrument of government made by the Local Authority is responsible for meeting the requirements of the law on education which are set out in the articles of government by the Local Authority. Section 24 of the Education Act 2002 provides that, where the governing bodies of two or more schools provide for their schools to be federated under a single governing body constituted under a single instrument of government, then a Federation of Schools is created. Federation is a matter for DfE and while we need to understand the term, it does not bear on our own role. Usually the trustees of the charitable foundation which originally provided the school (often the incumbent and churchwardens of the parish) continue to hold the school premises on trusts which in most cases require, or sometimes authorise, the trustees to permit the statutory governing body now responsible for the conduct of the maintained school to use and occupy the premises for the purposes of conducting the school. However, there have been many voluntary schools for which the Commission has made Schemes for the regulation of the charity; and a model Scheme for voluntary schools exists. These usually provide that the land or any land substituted for it must be retained for use for the purpose of a voluntary school within the meaning of the Education Acts. We need to exercise caution when making Schemes for voluntary schools as some schools were established and land provided under the Schools Sites Acts which may give rise to rights of reverter - see OG 27. We should not make a Scheme that triggers reverter rights. Where proposals would lead to reverter rights coming into force it will be for the Diocese to apply to DfE (or, in Wales, the Welsh Minister) for a section 554 Order which extinguishes reverter rights on the property. In some cases, the trusts attaching to school premises authorise, rather than require, their use for school purposes. In principle, therefore, the trustees of these trusts could decide to carry them out in ways other than by allowing the conduct of a maintained school in the premises. If there is any dispute regarding any part of this procedure, the DfE arbitrates. The Academies Act 2010 provides a mechanism for a maintained school to convert to academy status (ie leave LA control). Briefly, changes may be required to the objects and powers in the governing document to permit the academy company to occupy the charity’s property. The Secretary of State has some powers under section 82 of the SSFA to make Modification Orders to achieve this and so our involvement may not be necessary. This section sets out the steps in assessing educational casework; it is about the questions we need to ask in deciding our level of involvement. Education cases can be complicated because of how original education trusts were set up and subsequent legislation changes. You should use the questions and explanations in conjunction with the Responsibility Overview Matrix for Maintained Schools - link to B4.2. What type of school is it ? The main issue in determining the type of school is where the funding comes from. There may also be a clue in the title of the school but different naming conventions introduced by legislation can confuse matters. See the Overview matrix for maintained schools and section B1 and B2 of this guidance which looks at the different types of schools under the School Standards and Framework Act 1998. It is important to identify whether a school has occupation of land that is charitable. It is possible that non-charitable schools or schools that are exempt charities may be occupying, wholly or partially, charitable property. In many cases this may be as a result of the Elementary Education Act 1870 - See OG551-1 section B4. The charitable nature can be established by looking at the governing document. We should also consider if there is any subsequent legislation that has affected the way we deal with particular types of school. What kind of governing document does it have? The school itself will have an Instrument of Governance under the Education Acts. However, the land (or part of the land) occupied by the school may have been transferred originally by a conveyance or trust deed and may be controlled by persons other than the governing body of the school. Who are the trustees? It is important to confirm who the trustees of any charitable property are; this should be done by reference to the original trusts as affected by any subsequent legislation. In the case of some voluntary aided Church of England schools the trustees of the property may be the Vicar and Church Wardens with the property vested in the Diocesan Board of Finance or the Diocesan Board of Education with the school being run by a governing body set up in accordance with the Instrument of Governance. What are we being asked to do now? Requests we receive are varied and can include sales of school sites that are no longer used, which may in turn give rise to School Sites Act cases (See OG27). We may be asked about transfer of a school site where the nature of the school is changing, for instance to academy status. Who else should be consulted/ involved? This depends on the nature of what is being done. The Department for Education may be involved for schools converting to academies or sales of school sites. The local authority is also likely to be involved in such matters. Bodies who act as holding trustees for charitable property such as a Diocesan Board of Finance or vicars and church wardens could also be involved with sales of schools having religious connections. Where the charity is exempt we must consult the DfE as the principal regulator before we exercise any of our powers. The legal basis for casework concerning schools and education is extensive. Education law is administered by the Department for Education which is also the principal regulator for maintained school governing bodies that are exempt charities. Our involvement in such casework is usually on the basis of trust and charity law where charitable trusts are attached to maintained schools. Therefore, it is important for us to be aware of certain elements of education law so that we can assess the impact it has on charitable school and education trusts attached to maintained schools and understand what we must do where those aspects can overlap. Theses statutes can be found in full on www.legislation.gov.uk and information on their application in various circumstances can be found on the Department for Education website. Initially it is about identifying the type of school you are dealing with. The casework checklist at Case Study D1 sets out the questions you need to ask in determining the relevant issues of the case. This should be the starting point for any school case (excluding independent schools which do not fall within the remit of this guidance). No, our focus is to do with charitable trusts (usually school buildings and land) that are attached to maintained schools. Maintained schools have a particular definition under the School Standards Framework Act 1998 - see section B4.1. A key element is that they are funded by the Local Authority or in some cases the Welsh Government, but there are different types of maintained schools which is explained in section B Casework Guidance. Usually it will be any issues that relate to charitable trusts attached to maintained schools that the trustees themselves cannot authorise. This may be to do with disposal of land or buildings, cy-près Schemes or Reverter of Sites Act issues.